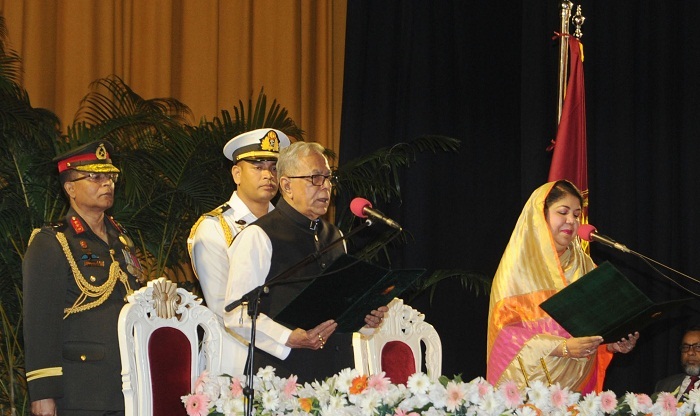 President M Abdul Hamid has been sworn in as the President of Bangladesh for a second consecutive term on Tuesday. The sworn-in ceremony was taken place at 7.45 pm on Tuesday evening at the Darbar Hall of Bangabhaban. Jatiya Sangsad Speaker Dr Shirin Sharmin Chaudhury administered his oath of office. Different satellite television channels broadcasted the live telecast of the sworn in ceremony. Prime Minister Sheikh Hasina, the Chief Justice, former Presidents, SC judges, cabinet members, lawmakers, senior politicians, diplomats and other dignitaries were present at the programme. Earlier, Abdul Hamid was elected the President on April 22, 2013 and sworn in as the 20th President on April 24, 2013. He took the responsibility of the President in-charge on March 14, 2013 while the then President Md Zillur Rahman was under treatment in Singapore. After the death of Zillur Rahman, he became the Acting President on March 20, 2013. Abdul Hamid has taken the oath of office as the 21st President on Tuesday making a new history as the President of Bangladesh for second term.